"Onwards and Upwards", that was John Connolly's battle-cry to Queens fans following the 4-1 demolition job on Clyde this afternoon. "It was a big thing for us coming on the back of two away wins for I was determined to keep the momentum going at Palmerston. Again Alex Burke was the difference, he scored the crucial goal - the third one - which really killed the game off, that's five in three games for Burkey and he's looking very sharp now in the penalty area, but the whole team played well out there today against one of the biggest and strongest sides in the league. I wonder what the pundits are saying now? Prior to the start of the season they had us written off as relegation candidates and now we're up there in third place in the table." Alex Burke himself was delighted with the result and said it was great to bag another two goals, asked if he was disappointed at being 'subbed' again when he was on a hat-trick Alex said, "A wee bit, but football's a team game and it's the result that matters not who scores the goals". The Man of the Match claimed the reason for his recent goal glut was a change in position, "Earlier in the season the gaffer had me playing wide left but now I'm upfront which is my favourite role and it seems to be paying off." On that vital third goal Alex said, "I just read the boys pass-back right, the ball broke for me and I stuck it in the net." Young Paul Burns reckons he must be somewhat of a lucky mascot for the team, said the starlet, "I came on at Paisley last Saturday when Derek Lyle got injured and since then we've won three in a row and scored nine goals. I'm really enjoying first team football and I just hope I can retain my place." Remember tomorrow to bring some extra cash with you for the half-time collection, the cause is the Macmillan Cancer Appeal, one that most people will know someone who has benefitted from their work. Former Queens favourite Des McKeown is running the New York Marathon to raise funds and has asked us to help him raise as much as he can. Full details can be found by clicking on the photo link on the top right hand corner of the page. Queens have been drawn against Hibs in the next round of the CIS Insurance Cup, the tie will be played at Easter Road on Tuesday 28th October. Commenting on the draw John Connolly said, "Yes, I'm quite happy with that one, although I would have preferred it at Palmerston, we seem fated never to get home ties in these sup competitions although Edinburgh is not too far to travel, I'm looking forward to the game for after the Old Firm, Hearts and Hibs are about as big as they come. I know Bobby Williamson very well and Hibs are one of my old clubs which gives me an added incentive to do well." Vice Chairman, Tommy Harkness agreed with the managers comments, he added, "Obviously I too would have liked it to have been at Palmerston, particularly for the fans who have more than their fair share of travel in the past couple of months, but it's at Easter Road so there's nothing we can do about it. However we have nothing to fear going up to Easter Road, for our away form has been brilliant in recent games and I'm sure we'll make a real fight of it." The last time we met Hibs was in the Coca-Cola Cup at Palmerston in 1994 - a game the Hibees won 3-0. The last time we visited Easter Road however was in August 1987. This was a Skol Cup tie and Hibs won 3-1, Jim Hughes scored for Queens and the crowd was 8000. Club Physio Kenny Crichton this week joined the club on a full-time basis as Business Development Manager. Kenny's role will involve him working closely with the Commercial Management team of Ian and Margaret Heuchan whilst developing the clubs profile in the community. Speaking to the website today in between appointments Kenny was extremely enthusiastic about the development of the clubs profile and has already made significant contacts locally and spoken to a number of local businesses regarding their future involvement with the club. Look out for some interesting developments in the coming months as Queens take a major step forward off the park to match the one that has been taken on the park in the past few seasons. Kenny would also like to hear from any Queens fans who have suggestions or ideas as to how the business can be developed, if you have something that you think should be considered then either email the website by clicking HERE or ring the club leaving your name and telephone number and Kenny will ring you back, the contact phone number for the office is 01387 254853. The club made a new appointment this week when Kenny Crichton became Business Development Manager. Said Vice Chairman Tommy Harkness Kenny is very experienced in this field having worked for a large publishing firm in the North East of England for several years. Margaret and Ian Heuchan will continue in their role as Commercial Managers but both are part-time and with the best will in the world there's only so much they can do. We're hoping Kenny can take the business side of the club that one step further to the next level, he has tremendous confidence and enthusiasm and we're convinced he can use his marketing experience to help the club. Kenny, who has recently moved from Newcastle to Hexham will of course continue in his present role as Club Physio." Apart from the injured Derek Lyle, Queens hope to have a full squad for Saturdays match with Clyde at Palmerston, said manager John Connolly "We do have a few niggling injuries but nothing too serious, also there will be a lot of tired legs after Tuesday nights. We'll assess the situation prior to the game and make a final team selection then." Two goal Alex Burke took the Man of the Match award from the IFC this week following the CIS Insurance Cup victory over Ross County. Second place went to Sean O'Connor and third to youngster Paul Burns. The IFC Player of the Season league table has also been updated and all of the individual scores can be found on the 'Latest Report' page. Following a few enquiries we'd like to announce the winner of the Queen of the South Scalectrix competition held in an Aviemore hotel on Tuesday morning was none other than Sean 'Schumacher' O'Connor. A trip to the capital is the reward for Queens following the victory over Ross County in the second round of the CIS Cup. The draw for the third round was made this afternoon and gave Queens a trip to Easter Road to take on Hibernian. The tie is scheduled for either the 28th or 29th October. "Absolutely brilliant", these were the words of a delighted John Connolly as he left Dingwall tonight, "It will certainly make the long journey home feel a bit shorter. It was an outstanding performance against a team sitting at the top of the table and considering the long journey we had to make. Young Paul Burns was on from the start and scored his first goal for the big team while Alex Burke is now doing what I always knew he could do - convert half chances into goals. We've been creating loads of chances in recent matches but haven't been taking them but tonight we finished them off which made all the difference. We've now beaten Ross County in our last four meetings. We've netted eight goals, conceded none and scored six times in our two visits to Dingwall - not a bad record! With eight Premier League sides seeded for round three we're now sure of 'Premier' opposition when the draw is made, obviously I'd like a home tie but if it's away from home again I'd settle for one of the 'Old Firm' which would mean a big financial boost for the club." Queens left this afternoon for their long trip to play Ross County in the CIS Cup, the squad will be staying overnight at Aviemore before heading north for Dingwall tomorrow afternoon. To keep the players active Physio Kenny Crichton has organised a gigantic Scalectrix set and will be organising a competition in the hotel on Tuesday morning. Apart from the injured Derek Lyle all othe players are available for selection, the striker was stretchered off at Paisley on Saturday with a fractured collar bone and ruptured ligaments in his ankle and could be missing for anything between four to eight weeks, however 'Tan-Man' is in good spirits and hopes to travel up to Dingwall to cheer the team on and it will also enable him to have a couple of sessions on the Physio's table. But we believe Derek isn't the only one suffering. Kenny Crichton himself was hurtling about Palmerston this morning after competing in the 13 mile Great North Run, "I'm feeling really sore" said the Physio, "But I completed the course and was only pipped at the post by Paula Radcliffe - by about an hour. Never the less I raised over £400 for the Yellow Brick Road - a childrens charity in the North East of England - but now I'm walking like the 'Tin Man' from the Wizard of Oz. To boost funds I charged every player £10 when they entered the physio room but they all paid up with a smile, they're a great bunch of lads." Captain Steve Bowey took the honours in the voting for the IFC Man of the Match this week, second place went to Sean O'Connor and third to his strike partner Alex Burke. The Player of the Season league table has also been updated, this can be found via the 'Man of the Match' link and the rest of the players scoring can be found via the 'Latest Report' link. Commenting on the match John Connolly said, "After our defeat last week this was exactly the result and performance we were looking for today, we made four changes to freshen the side up a wee bit with Paul Talbot, Alex Burke and Sean O'Connor in the starting line-up and Colin Scott taking over in goals from John Dodds. It just goes to show the strength in depth we have in the squad which augers well for the tough winter months ahead. Although we only won 2-1 we again created loads of chances and I counted no fewer than ten shots on target. It was a big game for us, for if St.Mirren had won they would have gone above us in the table and the reality now is that we've played six games - four of them away from home - and only trail the league leaders by one point. The only minus point for us was the injury to Derek Lyle, Del Boy has a fractured collar bone and ruptured ligaments in his ankle so it's not looking good at all, however when he hears the result it will cheer him up a bit, and as I said it was the tonic we needed after last Saturday and we'll now set off for Ross County in a confident mood." Derek Lyle was taken to hospital following an injury sustained in the 30th minute of this afternoon's game against St.Mirren. Although no details are available yet the injury appeared to be to the striker's leg. A very young reserves side won the Southern Counties league match versus Threave Rovers last night at Palmerston by three goals to nil. It was 0-0 at half time but two goals from 16 year old Craig Rudd and a single from Sean Ferrie gave the side another impressive victory. The reserves will play Threave Rovers reserves tonight in the South of Scotland League at Palmerston, kick-off at 7.30pm. "On Sunday November 2 this year I will fulfil two long-standing ambitions - to run the New York Marathon and to raise money for Macmillan Cancer Relief with every step. My admiration for the work Macmillan do for cancer sufferers knows no bounds. It's almost certain you will know someone - perhaps a loved one - who has benefited from their fantastic level of care. So when they wrote asking if I'd like to take part in one of their 2003 fundraising events, I jumped at the chance. Quite why I chose a marathon is still a source of debate between me and my hamstrings, but there you go. Fact is, I'll be there at the start on Staten Island and I'll be at the finish in Central Park. That's a promise. If I have to do the bit in between on my hands and knees, I'll get there. That's why I'm not writing to ask you for sponsorship per mile of the race. Instead, I'd be eternally grateful if you could find it in your heart to make a straight donation by cheque to Macmillan. In joining their team for New York, I have guaranteed to raise a minimum of £2,000. Of that figure, 70 per cent will go directly to Macmillan's work with cancer sufferers and the rest to cover the costs of flights, hotels and race entry. However, every penny over and above £2,000 is guaranteed to go to Macmillan. If you would like to contribute, please make cheques out to Macmillan Cancer Relief and send them as soon as possible to my home address, which is at the foot of the letter. In the build-up to the marathon, you will of course be able to read in The Scottish Sun about how myself and my fellow athlete and colleague Bill Leckie are fairing - and as they seem to have photographers man-marking us 24/7 these days, there's no chance of us skiving off. Truth is though, both of us are so committed to making a massive success of the race and the fundraising appeal that cutting corners is simply not an option. That's why although we're only obliged to raise £4,000 between us, we'll be desperately disappointed not to at least double that. With your help, we can get there. With your help, the work of a wonderful organisation can go from strength to strength. 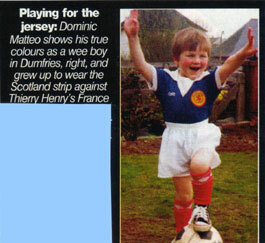 Hope to hear from all you Doonhamers soon. With no injury or suspension worries boss John Connolly reports a full squad available for this weekends clash with St.Mirren at Love Street. It's a visit from Hawick Royal Albert that awaits the Under 18's side in the Second Round of the SFA Youth Cup this term. Although the side will be mainly made up of the Under 17's side a competitive game is expected. The SFA date for the match is 12th October. The Queen of the South official programme celebrated its 70th Anniversary yesterday. The first issue of the Queens "Blue and White" official programme was issued not to celebrate the First Division debut of the club at the start of the 1933/34 season, but for a reserve team match against Beith on 16th September 1933. The eight page programme was printed at the Standard Press, Dumfries and priced at one penny. 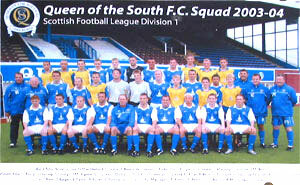 Editor William Welsh announced in his notebook that "On behalf of the Supporters' Club we have great pleasure in introducing the Queen of the South FC Ltd Official Programme to the football public in the South. In doing so we feel sure that we are satisfying a long-felt want at Palmerston. We trust our Programme will be well received and create a ready sale which will be beneficial to the club." Happy Birthday to all involved with 'The Queens'. Top scoring player in the IFC voting from this weekend's clash with Raith at Palmerston was Steve Bowey, second place went to Derek Lyle and third to 'keeper John Dodds. The full scores can be found on the latest report page and the Player of the Season league table has now been updated and can be found via the Man of the Match link. After the final whistle John Connolly said, "How we didn't score out there today was unbelievable, there were so many goalmouth scrambles, twice players were through one on one with the 'keeper and failed to find the net and Gonzalez himself had several great saves to keep a clean sheet. At half-time I told the boys 'to go out and have a go' and I can't fault them for effort, if we'd got back to 1-1 I think we could well have snatched a winner but it just wasn't to be, nothing happened for us out there today and we got none of the breaks - it was just one of those games. When we were 1-0 down and throwing everything into attack during the latter stages, there was always a chance they'd hit us on the break and that's exactly what happened. They're a good side and play continental style football, they're well organised at the back and pass the ball about nicely which makes it difficult for their opponents. Okay we lost the game but it's just one of those things and we'll have to go out and do better next week. Said Raith Rovers manager Antonio Calderon "Every player in my team can play good football and it was a good chance today to show it. On our game we will hold our own with any side in this league." Our condolences to former club Doctor Bill Balfour, whose wife Helen died suddenly earlier this week. Doctor Balfour served Queens faithfully for many years and is still on hand to help the present club Doctor Archie Downie when required. The funeral service will be held in St.Georges Church, Dumfries on Monday at 11:30am. Click below to read a feature article on Colin Scott. In a change to the schedule Queens reserve side drew 0-0 with a strong St.Cuthbert Wanderers side at Kircudbright tonight. Missing for Queens this week were both Craig Coates and Emillio Jaconelli whilst Paddy Atkinson also sat the match out. Queens have a full squad available for Saturday's match against Raith Rovers at Palmerston and will; be looking to stretch their unbeaten run to five matches. "It's a good position to be in", admits manager John Connolly, "but it brings its own problems since some players can't get a game, never the less I'd rather have it this way than being plagued by injuries and suspensions." The Kirkcaldy side could be minus two influential players - manager Antonio Calderon and experienced Sean Dennis who were both sent off in their last league game against Falkirk. It's actually in 12BC (Before Connolly) that Raith actually played at Palmerston. It was season 1988/89, one of the worst in Queens' long history, the Kirkcaldy side beat us three times and we managed only two wins and eight draws to finish bottom of the table with a meagre twelve points. Look out for an interview this weekend on the website with 'keeper Colin Scott. The article below appeared in the Sunday Mail this week, Dominic's father Albert, had Matthew's Cafe in the Vennel. They reverted to the Italian spelling, Matteo, when Albert moved to Southport. When he was in Dumfries Albert had an amateur team called Red Romans. Available this Saturday from the Club Shop will be A5 and A4 team coloured cards and A6 individual coloured cards of the players. Speaking exclusively to the website today, John Connolly spoke of his satisfaction at how the league campaign has started off but also his disappointment at landing another away tie in the C.I.S. Cup. Said the manager "It's hard to credit that we're almost half way through September and we've only had one home game so far. I feel for the fans, for not every one can make it to away matches, and it's also very hard for the club itself financially. At Queen of the South we rely on 'gate money' to survive and a lot of clubs would be in big trouble by now with the start we've had. Unlike Gretna we don't have a 'fairy godfather' who's prepared to plough millions into the club. If that was the case we would have more money to buy players and might even be able to afford our own private training ground. "We've had a very difficult start to the league with three of our first four games away from home and two of those against Falkirk and St Johnstone who must rate as promotion contenders, but we've collected seven points which is excellent. If anyone had offered me that at the beginning of August I would have bitten their hand off". Moving on to the cup draw, the manager shook his head in frustration "It's a nightmare--the worst possible draw we could have got" he admitted. "I've been with the club for just over three years now and we've played 22 cup-ties in the various competitions and only 8 have been at Palmerston. Not a very good average! And now we have a long midweek journey to Ross County coming up which means getting players off work and it will be about 4 a.m. before some of them arrive home. Hardly the best preparation for a tough match against Clyde on the Saturday, so it would have been nice to have had a home draw for a change. "Being seeded actually worked against us on this occasion but in recent years we haven't exactly been very lucky with the opposition. O.K., last season we had Aberdeen and Dundee, nice little earners but not really big money spinners. What all small clubs hope for are the 'Old Firm' or even one of the Edinburgh teams, away, which would ensure a five-figure gate, but the reality is we've to play Ross County. So it's no good mumping and moaning, we'll be going up there with a positive attitude. As I've said before they're a very good side but we've beaten them already this season and we'll be going all out to beat them again". When asked what a manager does when his team has a free Saturday? John laughed "There's no such thing as a holiday for a football manager at this time of the season" he replied. "I was at Palmerston for the Southern Counties game against Dalbeattie Star on Friday night, on Saturday morning we had a full-scale training session and in the afternoon I was off watching a match for you've always to be on the lookout for new talent. On Sunday, however, I had a day to myself -- I played golf in an Am-Am team tournament in the morning and we actually finished in the prize-list and in the afternoon I watched the British boys beat America in the Walker Cup on the telly. So there you have it!". All Queens fans who have surplus replica shirts in the attic are being asked to donate them to the Shirts for Africa appeal presently running. Organised by Dr. Fiona Vernon at Thornhill Health Centre a great response has been received throughout the region so far, however the number of Queens tops handed in isn't as high as was hoped. So if you can help then please drop your old shirts off at one of the following places; The Standard Office at the Loreburn Centre, Thornhill Health Centre, Atwal's store in Annan (Thorburn Crescent and Springbell's Road) and Georgetown Post Office amongst others. Queen's maintained their 100% record in the South of Scotland League with a comfortable 4-1 victory over Dalbeattie Star at Palmerston tonight. Craig Coates opened the scoring for the home side, Paul Burns added a second on the half-hour mark and just before the interval that man Emilio Jaconelli made it 3-0. Ten minutes into the second half Brian McColligan headed home a fourth but midway through the period Gary Burns netted a consolation for the visitors. In the monthly awards made by Bell's today for the SFL it was nice to see former Queens favourite Peter Weatherson receiving the Bell's Player of the Month award for the entire SFL. Well done to Nellie. The managerial award for the first division went to John Hughes at Falkirk and the Young Player award to John Sutton at Raith Rovers. A first Man of the Match award of the season for long range goalscorer David Bagan in the CIS Cup first round match versus Stenhousemuir on Tuesday night, second place was taken by fellow goalscorer Gary Wood and third by 'keeper John Dodds. The Player of the Season league table has been updated and the scores for all of the other players have been entered on the 'Latest Report' page. In the second round of the CIS Cup Queens will meet Ross County away from home, John Connolly described it as a nightmare fixture , "I don't know what we've to do to get a decent draw in the cups", he said, "this season alone we've had Stranraer away, Stenhousemuir away and now a long midweek trip to Dingwall, even if it had been at Palmerston it would have been better but there you go." With Inverness Caley Thistle being knocked out in the first round Queens were one of the twelve seeds together with the eight Premier League sides, Falkirk, Clyde and St.Johnstone. The tie will be played on Tuesday the 23rd September. Speaking from Ochilview following last night's victory over Stenhousemuir a relieved John Connolly confessed Queens were lucky, said the manager, "We've got to hold our hands up and admit we didn't play well tonight, however we competed well, especially in the second half and ground out a result so that's the important fact. There are always surprises in the cup and looking at tonight's results it just goes to show what can happen; Queen's Park beat Inverness Caley Thistle at Inverness; Arbroath defeated Raith Rovers and Dumbarton knocked out Ayr United at Somerset. We always knew this would be a difficult game and all credit to Stenhousemuir who battled well. With the dry weather the pitch was very hard and passes went astray. It wasn't ideal conditions for good football but the main thing is we won through and now go into the hat for the second round draw on Thursday so here's hoping we get a good draw for a change." Queens retain the squad that did so well against Ayr United on Saturday for the CIS Insurance cup tie at Stenhousemuir tomorrow night. Said John Connolly, "We have no injury problems, Eric Paton got a wee kick on the back of the leg at Somerset but hopefully he'll be okay and the rest of the squad are raring to go. Stenhousemuir are a division below us and go into the game as under-dogs but knowing John McVeigh his team will fight for every ball and I'm expecting a hard match. However if we play anything like we did in our last three outings we'll get a result. It's a big game for us as well for, apart from the four clubs involved in Europe, all the other Premier League sides will be in the draw for the second round which could lead to a lucrative match for us if we get through." Two goal substitute Sean O'Connor headed the voting tonight in the IFC Man of the Match competition, second place went to Derek Lyle and third to big defender Brian Reid. The full scores for the side can be found on the 'Latest Report' page and the Player of the Season league table has also been updated and can be found via the 'Man of the Match' link. Somerset Park is fast becoming a happy hunting ground for Queens having won both away games against Ayr last season and recording another victory today, John Connolly was naturally delighted with the result. Said the manager, "It turned out to be a comfortable win in the end, Eric Paton scored an excellent goal to give us a 1-0 interval lead and I was quite happy at that since we were against the wind. In the second half we had the wind at our backs and ran out worthy winners, both Sean O'Connor and Alex Burke took their goals well and had it not been for their 'keeper, who had an outstanding match, our goals tally would have been double, he thoroughly deserved the Man of the Match award. Any away game in this league is hard and to win is a real bonus, we've had three of our first four matches away from home and to collect seven points at this stage is absolutely brilliant. Once again our fans were great, I'm told there were over three hundred there and we all appreciated their support." John Dodds said he was "Chuffed to bits" to come back to Somerset and beat his old team, "Had it not been for Ludovic Roy in goal it could have been double figures", said the 'keeper. Ayr manager Campbell Money summed it up in two brief sentences, said Campbell, "Queens were by far the better team on the day. Infact they were very, very impressive indeed and it was four goals going on seven."